The upper limit of stable crab burrow widths was experimentally estimated. When the entire granular layer, containing a straight, horizontal tunnel of uniform diameter, is compressed from above, the tunnel initially shrinks as the soil is compacted. However, when the initial diameter is larger than a certain threshold, which depends on grain size – but, surprisingly, not on how densely the grains are initially packed together nor on the soil water content – the tunnel collapses abruptly without affecting the soil surface. But beyond a higher threshold, the ceiling of the burrow collapses completely, causing the soil above to subside. A pit then appears on the surface. When we walk on a sandy beach in summer we may find holes dug in the sand in the vicinity of the shoreline. Often these are entrances to sand crab burrows (Fig. 1). It is striking that the sizes (entrance diameters) of the burrows have a typical value (about 2 – 3 cm). Moreover, one never seems to find any very wide entrances (e.g. 10 cm in diameter). 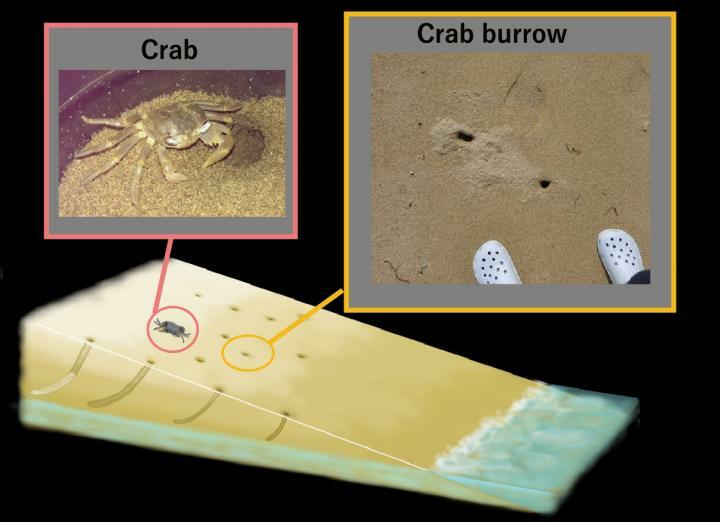 Why do crabs only dig narrow burrows? Of course, the crab's size is one factor: it doesn't need a large burrow if its carapace size is small. However, many types of crabs are much larger than sand crabs – why don't they dig burrows in the beach sand too?